The plastic surgery and dermatology team at The Ottawa Clinic recently collaborated with Rosemont Media for the creation of their plastic surgery website design. The new site has been equipped with comprehensive procedural details, as well as practice information to help patients learn more about the team. Each page has been designed utilizing innovative display elements to make the viewing process a visually stimulating and user-friendly experience. When arriving on the site, visitors will find a vertical layout with the navigation menu fixed to the left side of the page. While on the homepage, content is displayed in a unique format to help patients more easily find for what they are searching. This includes a “Cosmetic Possibilities” section, where patients can click on their age range to find relevant treatment options, including breast augmentation, dermal fillers, and skin care products. To help visitors find specific information about the practice, various tools are presented, such as the photo office tour to highlight their modern facility, as well as an out-of-town patients page to cater to those traveling and in need of accommodations. Additionally, patients can access the practice’s social media profiles and external patient review websites to learn more about the team’s reputation. Throughout The Ottawa Clinic website, patients can find detailed, original content, all of which has been optimized utilizing the latest SEO strategies. The site has also been developed with responsive capabilities, which causes the layout to detect and automatically adjust to the Internet device used to access the website. Whether on a laptop, tablet, or smartphone, visitors can utilize the website as an informative, easy-to-use resource. 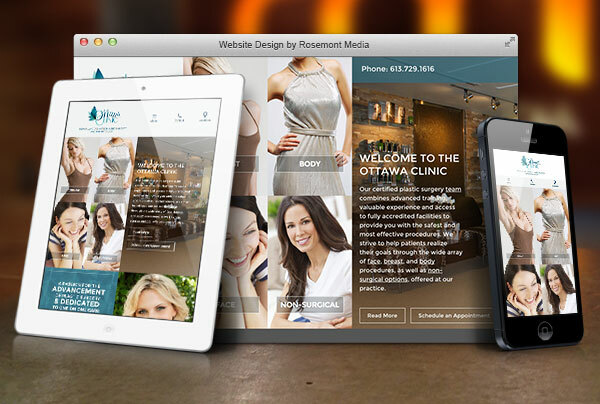 To see an example of what Rosemont Media can design for your practice, please visit theottawaclinic.com.